For the first time in years I’ve re-read the Hitch-hikers Guide to the Galaxy series of books. The work began life as a radio serial and which I fell in love with when I heard it on National Radio – the old 1YA – in around 1979-80. My schoolmates were baffled when I started raving about this show – radio programmes were Not Cool, at least, not when they were on National Radio, and I was somewhat prone to these decidedly unfashionable enthusiasms. The same schoolmates were, two years later, in love with the show when it appeared on TV. I never liked the TV version (nor, I later discovered, did Adams). 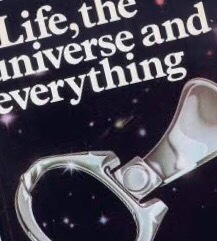 But in recent times, I’ve e decided that Douglas Adams was a seer, a prophet of our time – in ways which were not readily apparent when the series first appeared, at the tail end of the ’70s. This is not so much about working out that, as was revealed early on in the series, that the meaning of life might happen was 42. This was, I suppose, interesting but ultimately unhelpful. Some of the other material in his “increasingly inaccurately named Trilogy” – the five books of the hitchhiker’s guide to the Galaxy series – was prophetic. In particular the ‘B Ark’ which features in the second book. The idea here is that the planet Golgafrinchin discovered that it was about to be destroyed so it loaded all its people onto three ‘Arks’ to colonise a new planet. All the leaders, the scientists, the engineers the people that actually made stuff they got put on the ‘A’ Ark. On the ‘B’ Ark were put management consultants, hairdressers, the marketing people, public relations executives, and so forth. Oh, and telephone sanitisers, a group which seem to have attracted Adams’ particular attention for some reason. The two heroes, Arthur Dent and Ford Prefect, find themselves through a series of improbable events on the B Ark which, they discover, is headed for planet Earth. The captain of the B Ark spends time in the bath, again for reasons which are not adequately explained. It also becomes clear, after a few pointed questions, that the ‘B’ Ark is programmed to ‘not so much land, as such’ as crash onto this new planet. It also becomes painfully obvious to Arthur and Ford – though not so much to the colonists on the B Ark – that the Golgafrinchins didn’t actually send either the A or C Arks but they simply loaded a bunch of people who weren’t much use onto the B Ark and told them a covoluted cover story story as to why. We could try this sometime ourselves, maybe. But that isn’t actually my main point. What I find intriguing to be thought-provoking right now, is that these this group of management consultants and so forth, who land on prehistoric earth and quietly take over from the cavemen, decide to adopt the Leaf as their common currency. This works very well initially because they all become immensely rich. The trouble is that they then get a problem with the overvaluation of the currency. Any parallel with the quantitative easing by central banks since 2009 – how many trillion US dollars is it now? I’ve lost count – should be obvious. It’s why global share and property markets have gone berserk. Asset price inflation is an amazing and scary thing on this scale. The main question for us, now. is what happens when someone decides to do the equivalent of burning all the forests down. The other one is the Planet Krikket, which features in my favourite of the book series, ‘Life The Universe and Everything’. This is always been my favourite. It is darker than the others – according to a recent biography of Adams he wrote it when depressed. Krikket is a planet of gentle, peace loving folk who believe they are alone in the universe, but when they discover they are not, the shock to their worldview is so great they decide the only thing to do about it is wipe out the rest of the universe. So this gentle, peace-loving race turn into a group of genocidal maniacs. It’s a bleak view of what happens to human beings when confronted with something which utterly challenges their assumptions about life. It’s also depressingly accurate, in many cases. The “wiping out” can be metaphorical rather than literal – thankfully, it usually is, and I suppose this is the lesser of two evils. But it is still wrong. And all too human. Posted on May 25, 2016 January 3, 2017 by Rob HoskingPosted in books, Douglas Adams, HeroesTagged depression, Douglas Adams, Life the Universe and Everything, Towel Day. Next Next post: Budget day: ‘I have made you sad’.